A couple of weeks ago, I participated in a session on what to do about the banks at the Momentum event, The World Transformed, in Liverpool. This was, of course, taking place alongside the Labour Party conference and attempting to complement it with debates, discussions, etc. The session on banking took place at the same time as Jeremy Corbyn was speaking with other big names in a separate TWT session. Nevertheless, over 100 came along to discuss what to do about the banks. The chair was Sarah-Jayne Clifton of the Jubilee Debt Campaign - part of a global movement working to break the chains of debt and “build a finance system that works for everyone”.1 Founded in 1996, it is a UK-based charity focused on the connections between poverty and debt. Matt Wrack, the general secretary of the Fire Brigades Union led off the session. The firefighters have a socialist clause in their constitution and have campaigned since the end of the great recession for Labour to nationalise the big banks. The FBU commissioned a pamphlet called Time to take over the banks, co-written by Mick Brooks, a Labour economist, and myself.2 Matt Wrack pointed out that Labour had a great opportunity to act on the banks when the global financial crash ensued, but the then Labour leadership - infused with “neoliberal”, pro-market, pro-finance ideas - did nothing, except bail them out. Indeed, Labour leaders adopted ‘light touch regulation’ of the banks, praising the City of London. As chancellor in 2004, Gordon Brown even opened Lehman Bros’ new Canary Wharf office, saying “Lehman brothers is a great company that can look backwards with pride and look forwards with hope”! As we know, the bankruptcy of this rapacious US investment bank was the trigger for the global financial meltdown. Yet it seems, said Wrack, that even now the current trade union and Labour leaders are unwilling the grasp the nettle and deal with the big banks. Ann Pettifor is a well-known UK-based analyst of the global financial system, director of Policy Research in Macroeconomics (Prime) - a network of economists concerned with Keynesian monetary theory and policies - and an important advisor to the current Labour leadership on economic policy. Ann argued for the Bank of England to be brought under democratic control and then used to provide funds for the big banks - as long as they were committed to use it “productively” in investment and jobs, etc. 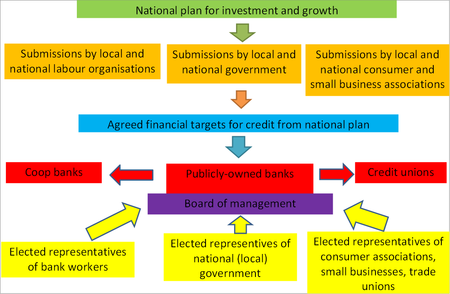 This would go alongside the current Labour proposal for a National Investment Bank (NIB). In my view, none of these approaches is likely to deliver what we need: namely, turning banking into a public service for the many and not a speculative, tax-evasion tool for the few rich investors and corporations. Surely, the history of the period leading up to the global financial crash - the wild credit boom, the sub-prime mortgage crisis, the ‘toxic’ derivatives, etc - has shown that the big banks will not be a public service without them being publicly owned with democratic accountability. And the period since (the last 10 years), only confirms that view. In my contribution, I outlined briefly how the big banks, even after the end of the global crash and the bailouts, have carried on just as before - it is business as usual. Or as Lloyd Blankfein, the head of Goldman Sachs, the world’s most predatory investment bank, once said: they continue to do “God’s work”. And what has doing “God’s work” entailed over the last 10 years? A never-ending litany of scandals - particularly by British banks. Take RBS, Britain’s largest bank, which was partly nationalised after the crash. Before that it had been run by ‘Fred the Shred’ Goodwin (so named for his penchant for slashing lower-ranked banking jobs and bank branches). Sir Fred Goodwin was knighted for his “services to the banking industry” by the then Labour government. He was noted for his bullying of staff and his love for risky ventures and huge bonuses. After driving RBS into near bankruptcy in the crash, he left - but not before taking a fat pension and handshakes from the RBS board, as have all the senior executives of the banks when they have been asked to ‘step down’ following a scandal. After the crash, RBS was prominent (while still part-nationalised) in the notorious Libor-rate rigging scandal, where bank traders colluded to fix the interest rate for inter-bank lending. Libor sets the floor for most loan costs across the world. That rigging meant that local authorities, charities and businesses ended up paying billions more than they should for loans. The rigging activities of RBS appeared to have been even worse under the ‘watchful’ eye of Stephen Heston, appointed when the bank was nationalised. For two years after Heston got the job, the Libor traders in this publicly owned bank carried on rigging the rate, even though they knew it was illegal. Then there is Britain’s next biggest bank, Lloyds Bank (also part nationalised), which took over the scandal-ridden Bank of Scotland in the crash. Along with all the other banks, it has had to compensate customers for mis-selling them personal injury insurance to the tune of £5 billion. During the crash, Barclays Bank was run by Bob Diamond. It has now been revealed that when Barclays was threatened with partial nationalisation, its board loaned money to Qatar, which then invested in the stock of the bank to the tune £12 billion. In this way, the bank avoided state control by issuing more loans for equity. It is still not clear what ‘commissions’ were paid to Qatari investors. And then there is HSBC. In the US, HSBC was fined $5 billion by the federal authorities for ‘laundering’ money for Mexican drug cartels! In Switzerland, former chairman Stephen Green was also doing “God’s work” for HSBC. Reverend Green, an ordained vicar, in 2009 published Good value - an extended essay on how to promote “corporate responsibility and high ethical standards in the age of globalisation”! The good reverend was in charge of HSBC’s private banking division based in Switzerland, which was engaged in concealing the ill-gotten gains of thousands of rich people in many countries who did not want to pay tax. HSBC arranged various schemes to enable them to recycle their cash back to the UK and other countries without tax payments. Indeed, tax evasion is just what privately owned, as opposed to democratically accountable, banks get up to: providing tax avoidance and evasion for very rich people and corporations.4 Take the very latest scandal emerging from Danske Bank, Denmark’s largest. After the global crash up to 2015, Danske’s Estonian branch laundered over $200 billion of Russian and British corporate cash to avoid tax. UK corporate entities were the second-biggest proportion of customers, behind the Russian mafia, of 15,000 non-resident customers at the Estonian branch of Danske, making this one of the biggest money-laundering scandals ever. Surely we cannot let this continue? A proper banking service should take our deposits, look after our savings and offer loans to households and small businesses for big-ticket items at reasonable interest rates. But the current banking system is much more interested in speculating in financial markets for big bucks, making corporate finance deals and helping the rich evade payments - while top executives take home huge wages, bonuses and pensions. It simply isn’t good enough to expose customers to IT failures, including delays in paying bills and an inability to access their own money. High-street banks justify the closure of their branch networks on the basis that they are providing a seamless online and mobile phone banking service. These justifications carry little weight if their banking apps and websites cannot be relied upon. As for providing credit for productive investment in the economy, it is a joke. In our report for the FBU we calculated that less than 6% of bank assets go to industry for productive investment. The big five British banks control 60% of all lending; their firepower for investment is much greater that Labour’s proposed NIB will ever have. But the big five banks do not use that credit productively. The NIB will not succeed in turning the British economy around if the big five continue to do “God’s work”. Instead, another financial crash and recession is more likely. So public ownership of the big five is essential. Even if the government bought all the shares at market price it would cost only a one-off 3% of GDP (not that full compensation to shareholders is merited). That could easily be financed by the issuance of government bonds and serviced easily with the revenues and profits from the big five. The top executives of these banks would then be paid civil service salaries and have no shares - bank workers and trade unionists would sit on the boards to ensure accountability. Public ownership does not mean more bureaucracy - on the contrary, it means more democracy. What can public service banks do? Well, take the example of North Dakota. The main bank in this rightwing US state has been publicly owned since the great depression. It looks after the deposits of customers and provides loans for households and farmers, and any profit it makes goes back to the state government. It does no speculation and no laundering. It did not suffer during the global crash. As for investment, take the role of China’s state banking system. Whatever we might say about the autocratic, one-party dictatorship in China, its state-owned banks provide credit to support a national investment programme that has transformed China’s infrastructure. I came up to Liverpool on one of Britain’s privatised train routes. It left one hour late because of “engineering works” and crawled up to Liverpool at a maximum speed of 75mph. On the same day, China launched a new high-speed service (220kmh) from Hong Kong to China, linking it with 15 cities: punctual, modern and cheap. This high-speed rail service reduces the need for air flights and lowers the carbon footprint. And all this was financed by state bank loans and railway bonds. But this will only work if we have the core of banking in public hands. If diversification means keeping the big five still owned by capital with just small banks and credit unions around the periphery and/or competing with the big five, then that would be like saying the health service should have at its centre big private health companies with only small public operations in the community. There seems to be a reluctance to opt for public ownership at the centre of the banking system. Why only railways, energy and water? The lack of momentum on this crucial cog in controlling the economy ‘for the many, not the few’ seems to be partly based on fear of the media and the City of London’s response. But breaking up the banks or taxing them, or giving workers shares in them, as John McDonnell is now proposing, will provoke just as much antagonism from capital - but without delivering banking as a public service and a force for productive investment.